Our last stop on the Lleyn peninsula was at Nant Gwrtheyrn on the north coast. 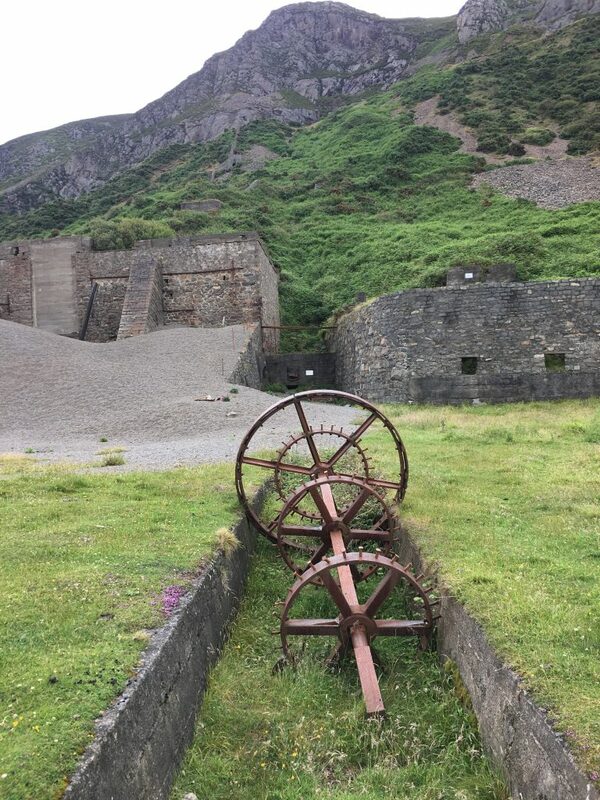 This heritage centre is home to the National Welsh Language Centre as well as having some installations relating to the history of granite quarrying in the area. We arrived at a large carpark, helpfully split into sections by wooden bollards which we assume was to stop the boy racers from using it as their personal skid pan, and although we could still see a few tell tale tyre tracks we didn’t have any late night disturbances here. From here you could see the quarry scars to the north of the village. From the carpark there was a plunging switchback road to the heritage centre itself and although it was a good road we didn’t fancy taking Bertie down there, or back up again. As we walked down we could imagine the how isolated it would have felt for the inhabitants. The village is nestled in a deep valley on the coast with quarries to north and south making the walls of the valley seem even steeper. Leaving the village would have been a significant effort. In it’s heyday at the end of the 19th century the village had more than 200 inhabitants living in cottages or dormitories with all of the necessary services, chapel, school and shop, but it was largely abandoned by the 1950s. Some of the buildings have been renovated and house the language school, a café and historical information. 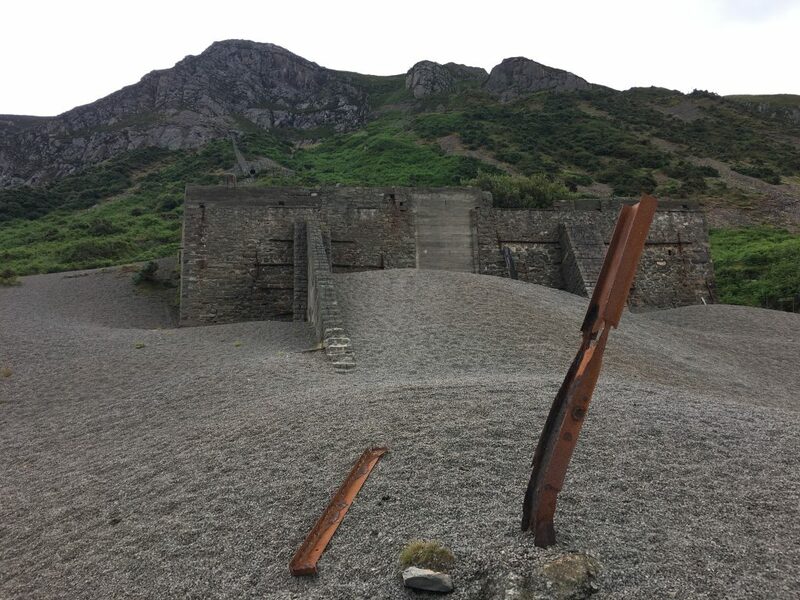 Other buildings are still ruins and once you get down to the beach you can see the old workings that would have been used to transport the quarried stone ‘setts’ from the top of the slopes down to the waiting boats. There are twisted rusted remnants of iron all along the beach. I don’t think I’d be that keen on swimming there as you don’t know what might be under the water. 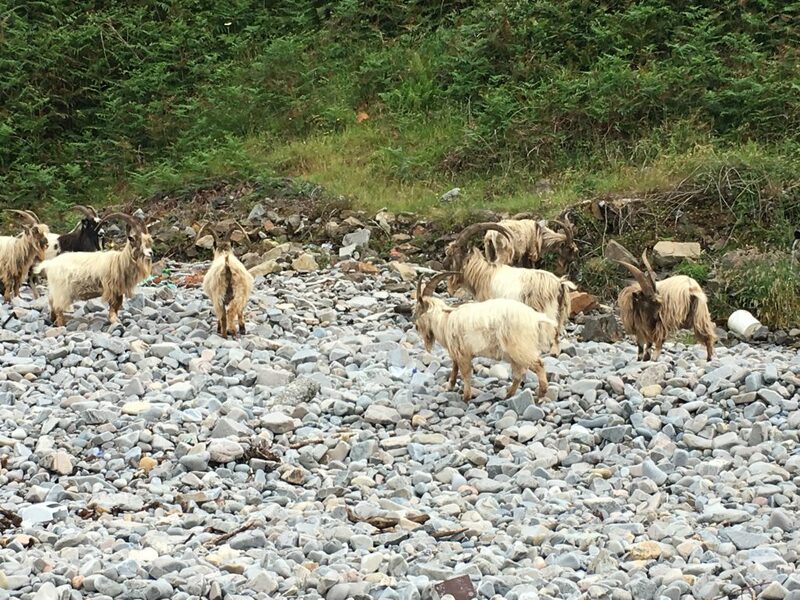 We walked along to the quarry at the southern end of the beach where sheep and goats were now perched on the quarry ledges. It felt really remote and there were hundreds of guillemots flying around the cliffs and sitting out on the waves. Paul did a spot of fishing (caught a mackerel for our tea – but just the one) until the rain started, then we made our way up through the quarry and across the top of the cliffs, getting gradually more and more damp as the rain set in. 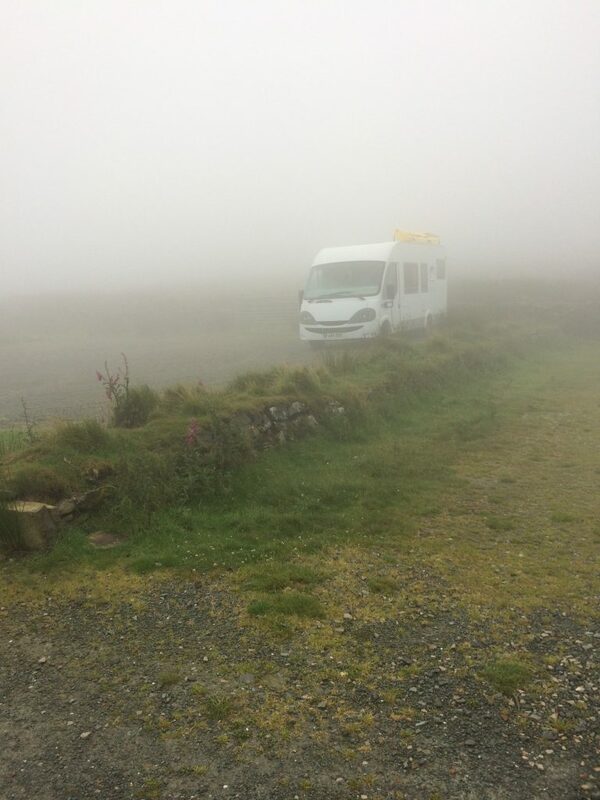 As a sleeping spot it was lovely and peaceful, but quite spooky in the morning when we were shrouded in cloud and fog and could barely see anything. As this was our last day on the Lleyn it was time to move on, but not until we could see where we were going. Im loving this Becky Boo!